Take the clinical and practical approach to reducing everyone’s pharmacy spend. Discover how looking out for your employees' best interests can benefit your bottom line. of every healthcare premium dollar are spent on prescription drugs. of large employers have moved to high-deductible health plans. of employees believe their company’s well-being programs contribute to a healthier lifestyle. Typical claims analysis for self-insured employers reveals a 20%-30% savings opportunity through our solution. When a member takes action on a savings suggestion, they save an average of $517 per year for themselves and the plan. Fast, flexible implementation (typically 14 weeks) and proven member engagement campaigns mean less work for your teams. Healthcare takes more from a paycheck than ever. Give employees a tool that puts some back. Medication can be essential to physical and mental health. Help them afford and manage it better. Many factors affect workplace performance. Take prescription stress off the list. 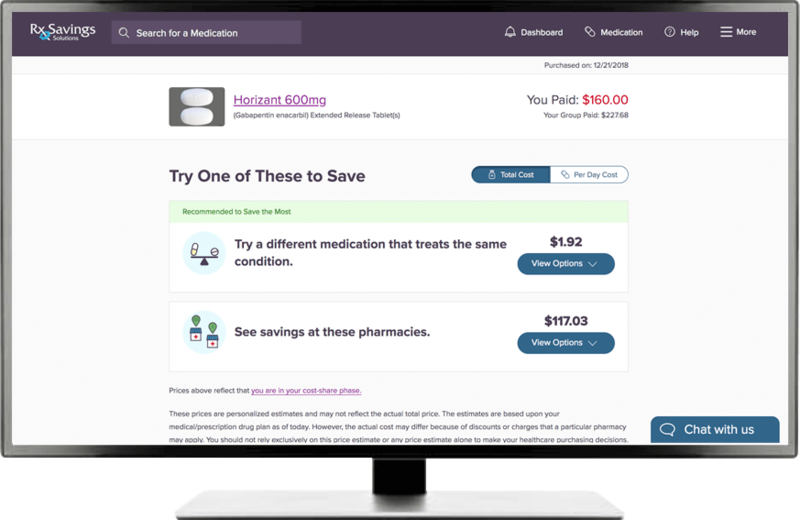 Rx Savings Solutions navigates the pharmacy benefit labyrinth and boils it down to simple, clinical and actionable choices. Proactive notifications tell your employees when savings opportunities exist. No effort required. Changing to a lower-cost prescription should be easy. It is now. Adherence tools keep your employees organized and on schedule with their medications. Our Pharmacy Support team complements the solution with live, concierge-style support. I like doing business with Rx Savings Solutions—they're honest and insightful, deliver what they promise, and are willing to listen and evolve. They get two thumbs up from me.